We have been having numerous discussions about the best solution for the view picker for many months now. And as of today, the debate continues. If the answer was crystal clear it probably would have been done already. Our purpose with this blog post is to invite you into the internal discussion and to invite some comment on the topic to ensure that we are solving the real issues as you, the customers and users of Informant 5, and Informant 4.94 see it. We have identified the following 4 Primary issues with the new View Picker. Please let us know if you agree or if you have others. Issue #1) It now takes 2 taps to change to any view. A valid concern, but which views are users most likely to switch between? The crux of this issue goes all the way back to some of the reasons why the original view picker needed to be re-designed. Too many different options, and too many maintenance issues with the old custom tab bar (which, now looking at iOS 11 would have only grown worse). Issue #3) When 5.0 came out, the view buttons were no longer customizable – though, we addressed this in 5.03, so now you can turn off views that you don’t ever use. Issue #5) iPhone vs. iPad The new Smartbar buttons hide features because of limited space on the iPhone, but there is plenty of room on an iPad. Maybe there is more of an issue with the iPad users experience? What were the “wins” with the new View Picker? Consistent navigation. There is one main button that initiates most navigation functions. 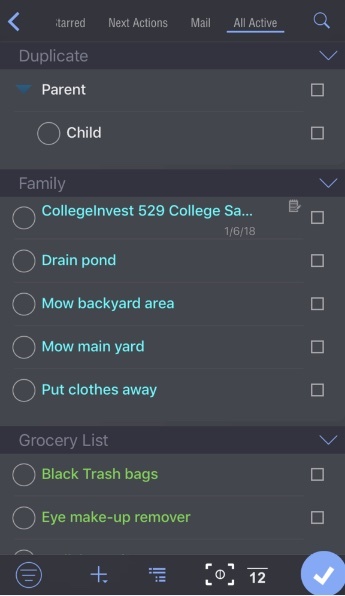 This made it easier for new users to get familiar with the app and provided a consistent place in the interface for things like the settings button. While some people initially had trouble finding things like settings, it is a very familiar navigation & keeps the buttons in the same area on the screen. Moved more action buttons lower on the screen. This is more in line with Apple’s guidelines (to make it easier for one-handed use on larger devices). 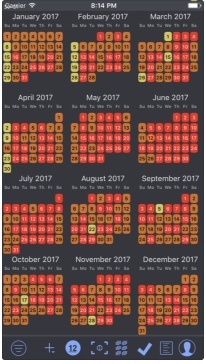 No more special/fidgety calendar menu. So far we have identified 5 possible variations. Have another idea? Please comment on the solutions that you like below. 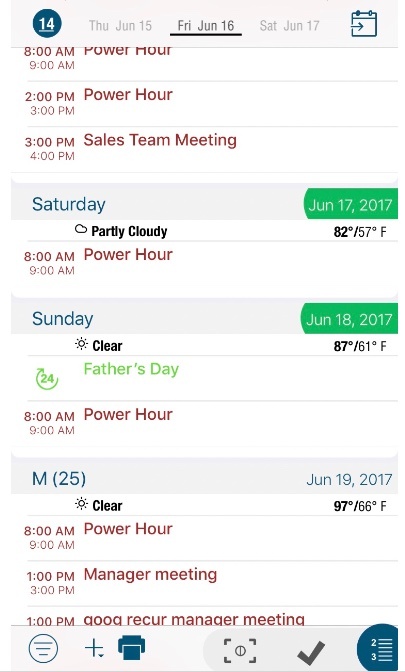 This is an option that keeps the Smart bar but adds some additional buttons on the Calendar & Task pages. Pros: the One-click between commonly used views is regained. Cons: it can make the UI a bit crowed. 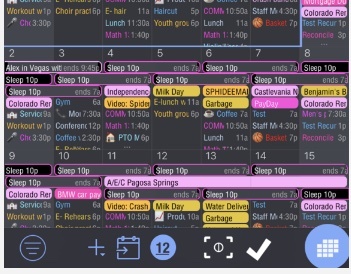 2) Stacked 2-Bar Navigation: Bring back a tab bar on screen for view switching (similar to what we had in PI4, but stick with the Apple Stock tab bar – so no sliding back and forth and no special calendar menu. This means you could use it to store 4 of your favorite views to switch between with one tap. The I5 view picker would remain to get to all the other views. The toolbar would then sit on top of that – again keeping it on the bottom of the screen for easier use on large devices. Cons: it stacks two bars of buttons on top of each other – it feels a tad cluttered and it could lead to mis-taps between the toolbar and the tab bar. 3) Go back to the old PI4.94 view or create a mode that would be more like the old one. Pros: the One-click between all views is regained. Cons: we re-inherit all the problems with the old tab bar (non-discoverable sliding bar for new users and a 3-tap calendar view change). Also, we re-inherit a lot of bugs in the process and we very likely break even more with some of the new stuff that Apple is bringing out in iOS 11. 4) Tap-Slide-Release: This is an idea that would make use of the current SmartBar but would allow you to “tap and slide” your finger to the view you want to change to and then release to switch. 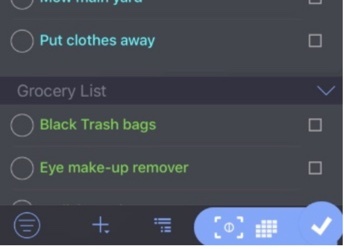 This would be coupled with getting rid of having to go “through” that Informant Home screen so that you don’t ever lose sight of the current view. Pros: While not quite a “single tap”, it’s pretty close and potentially could feel a lot faster to use than two taps. Cons: While the feature would be available, it wouldn’t be easily discoverable. We would have to rethink how to invoke “text dictation” since we currently invoke it with a tap-hold gesture on the view picker button. a. Remove the focus screen. c. Tap Smartbar button returns to “last viewed”. This is a variation on the “return to 4.94” but just doesn’t provide enough room for all the options we need to have. We encourage your comments below. If you are referencing a certain image in this blog post please list the “Fig #” reference. Also, please comment on “Issues 1-4” to let us know if we have it right. We look forward to the dialogue & getting some new view picker options out to you as soon as possible. Firstly, thanks for inviting us to contribute to this decision. • 5 buttons and the I5 view picker available at the bottom of the screen – from the option 5d screen shot it looks like you can fit 6 buttons without it looking too crowded. The 5 buttons can be customized to include any of the existing options available at the bottom of the screen or on the I5 Home screen. • The remaining options/view buttons are then accessible using what is currently the I5 view picker button on the bottom right. When you select this the remaining options/view buttons slide up over or above the fixed bar similar to 2a but with however many rows of buttons are required for the remaining options/views. The position of these buttons should also be configurable by the user – similar to how you can build your own customized Safari toolbar by dragging and dropping buttons. You could also include the settings button, search and microphone bar on the top of the slide up options section – this would make it more accessible than it is now because it would be nearer to the bottom of the screen. Maybe we could test 1b. But I can live with the actuel way..
My two cents…First know that the screenshots above are all old. Don’t vote based on *details*. Vote on *idea*. Many specific details have changed considerably from all of the screenshots above. We could certainly move the settings to the bottom of the slide up – but not the microphone. It has no context at that point and is confusing what it does. That said – I vote against this. Why? 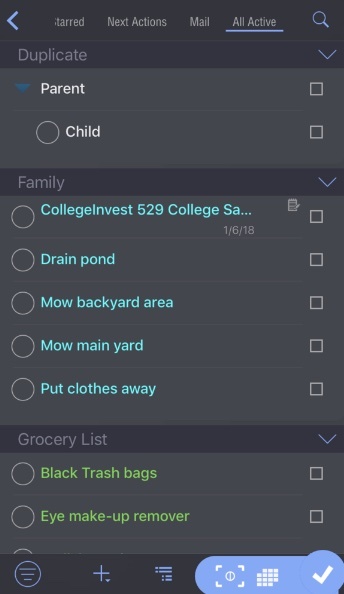 I’m not certain that just because the Views are shown in the bottom bar that they shouldn’t also be shown in the Informant Home View picker screen. That would mean that depending on the view I want to use, I have to think – is it on the bottom or in the view picker? 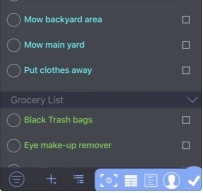 I see the tabs on the bottom as a shortcut, not as a replacement. My personal vote is 1 . I do not like 5 at all because its non-obvious what those buttons do – why are they white, etc. It just looks weird. As for customization – I’m very much against it beyond what we have now: the ability to turn on and off which views are accessible. Why? 1. Customization of the toolbar would be a nightmare. Potentially you have about over a dozen pages you’d have to customize, and some of those buttons are dynamic…so this one is out of the question. It would add dramatic amount of complexity to settings that 99% of users would never touch, and to code. 2. Similar to #1, I don’t want to have a bunch of complexity to settings, and adding too many settings is just *a bad idea*. So I can see maybe doing on/off or order of the views. And that ONE set of settings is used across all areas. Thank you for sharing this, I will need to read carefully during the day. I expressed at length my opinions commenting a previous blog post. I just want to add for the moment: PLEASE consider differentiating iPad and iPhone!!! For example, having two stacked bars when there is so much wasted space really looks like an abomination! I tend to agree with you on the stacked bar thing. And YES, we need to differentiate between iPad & iPhone.Good Insight there. Maybe give them each a bit of unique treatment. I just added an iPad screenshot to the post (Figure 1e). My vote is to focus on modifying/improving the current concept/iteration which, I guess, means option 4, slide and release. And/or option 1, combine. Option 1 essentially just adds some more buttons to the bottom bar, right? But I would not add more than 2 more buttons. regarding “instant” availability of the view picker, if you must include a pretty transition, maybe use a fade-in instead of the slide out. But with the fade-in the buttons are hot even before the fade-in completes, so you get a pretty UI element and rocket fast use at the same time. The buttons are in the same place so the user knows where to tap before it even completely appears. This comment just made me realize that the slide-out also contributes to the heaviness feel, and makes the two taps feel worse than they are. As far as I can recall, this has not been mentioned but I think it has contributed. What is it, a .25-.33 second of just pausing and waiting to tap the next button? It just adds to the heaviness and slowness. In summary: nix the home screen, nix the slide-out transition, and make the view options instantly available for tapping. Then consider more drastic redesigns. The “home” view does not slow down anything. Its identical both ways. The animation is currently based on the device refresh rate. Its as fast as it can be. The next iteration would be no animation at all. It can be instant then – but it does lose the cool animation that I love. As for the icon – I’ve never seen it not be the correct icon. When do you see it not be the correct icon? I agree—the slide-out animation is very nice. But I really think it has ended up contributing to the “burdonsomeness” of 2 taps. In addition to the delay (which feels much longer than it is because the user tapped the view picker for one reason only: to make a second tap. thus the wait feeeeels longer…) the animation also suggests to the brain that you must follow it in order to know where to tap next. In other words, it actually makes the user—ever so slightly—less sure about where to tap next (even though it’s always the exact same place). Then the “home” screen change grabs the attention of the user, giving another distraction to the brain thus slowing down the user’s cognitive process of just trying to tap a second button. When we are talking about such a narrow aspect of “2 taps is too many taps” these little tiny details really add up. By the way, personally, I like the “home” page of the view picker. But I can do without it if it helps other users be ok with the 2 tap navigations. 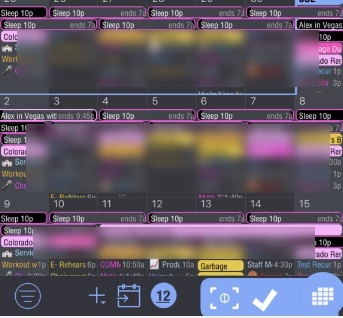 90% of the time I use monthly view and todo screens, 10% notes. What if instead of redesigning buttons, you would add gestures similar to changing desktops with Mac. For example I would set-up my default “desktops” to monthly view, todo and notes in settings. 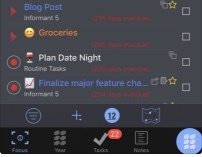 In order to change between these views, I will single finger swipe on the lower bar where 4 icons are, or even better two finger swipe anywhere on the screen to flip the screen from monthly view, to todo, then to notes and back to monthly view. I would then use current right lower corner button to access rarely use views. Users should be able to setup their frequently used views in settings. Thoughts? I assume you can just add left and right arrows to the bottom menu to do the same, but it would a less elegant solution. Or perhaps just one additional icon to flip between two favorite views defined in the settings. You’ve already heard and knew the main concerns along the way, and your heart know the answers base on your expertise. For God sake, “Just Do It”, and resume the App as an intuitive productivity tool. Unless it is no longer focusing on speed and productivity but exhibit iOS new fancy features, otherwise it is quite a common sense to tell which way is more direct, effortless and intuitive to use your App. By 80/20 rule to fit the most essential requirments, please let Chris go ahead and deliver his work, and we will all give you a big round of applause. Really appreciated. 100% agree Takeaction. For months now we have been treated like market researchers. Surveys and suggestions and pleas, hundreds and hundreds of comments worth. How much more information do you need? You know how to make a product we love, “just do it”. Please. It addresses the “1-click” issue, the “speed” issue, and the configuration issue. This will be going to beta users this week. If all goes well this could be in production by early July. Looks good–a major step to bring back some ease-of-use lost between Informant 4 to 5. Some questions and comments. 1. When you go to a view without a short cut (Contacts, say, in your example), I assume the smart bar expands by one? 3. 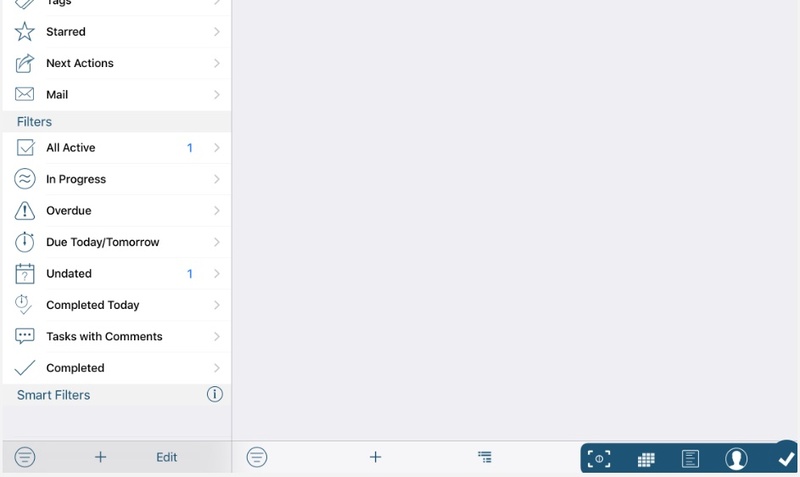 On the iPad–bigger screen, no 3-D touch–could we have another shortcut or two? Your mock-up in Figure 1e has a nice comfortable arrangement of buttons. All in all, a significant improvement and pretty creative in addressing those of us who want a more 1-tap interface and those who want to keep it as is. 1. the “shortcut” bar is configurable so depending on how YOU set it up, 0-3 buttons might show. 2. Force touch is staying the same. So, probably yes. I would say Windows 95 gave us a solution 20 years ago: a customizable task bar with what ever buttons that users like to put on, and a smart menu to access all the rest. Microsoft tried to changed it on Windows 8 but you all know what happened. I mainly switch between focus view and monthly view. Would it be an idea to go with the current implementation but add the possibility of having the user define two main views. With a double-tap on the main button I can switch between my two main views. Please, please, please don’t change a thing about the view picker. It is absolutely fine the way it is. I spend a great deal of time in Informant every day as I’m sure many others do as well. The view picker works very well for me as is. The issues described are trivial. It takes 2 clicks to change a view? It feels heavy? 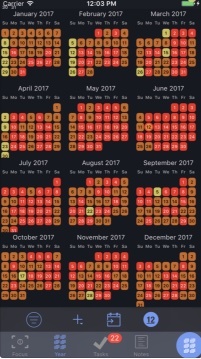 No text labels? Good grief! Get over it! Two critical things for me is always 1) a rapid/efficient UI (no lag, no ‘heaviness’ as well described above, no delay, no jarring/distracting secondary screen (‘home’ or otherwise)), and 2) screen real estate (which is why I chose the text only tab bag in PI4 which was the thinnest choice) – so please, no double stacked bottom buttons. So I basically agree with boydston01 on speed/efficiency. .
I’d have Choice of buttons for the rapid bottom bar (I use focus, month, notes often). I don’t mind double tap as long as it’s super fast and zero delay. I feel a touch and slide action will actually feel longer. Since I spend I great deal of time using my iPad Pro, I prefer having buttons on the bottom of the screen with my choice of configuration. 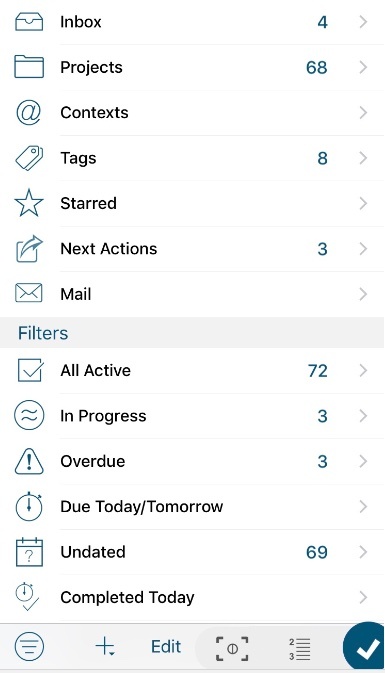 On my iPhone, I switch between week view and task view, the most. Remember, the primary concern is 2 taps is too much. But what users (mostly) really MEAN is that two taps is too slow and hard. So before redesigning, make two taps FAST and EASY. Then consider a redesign if it’s still not good enough. The more I think about it, the more I vote AGAINST making any substantive changes to the view picker. The current concept is very clean, has an elegance to it, and unifies navigation. It is also much more scalable if you remove the home screen! Please just improve the current concept: remove home screen, nix slide animation, and figure out how to better distinguish the icon options (maybe text options for vertical options, maybe some strategic shading/coloring like to distinguish views and/or identify similar views (like the 2 day-level views would have a similar visual element). I like figure 1b. I tend to live on the focus screen with occasional access of tasks and calendar. I do not like the double stack. I do wish there was a way to set the focus few as a default. 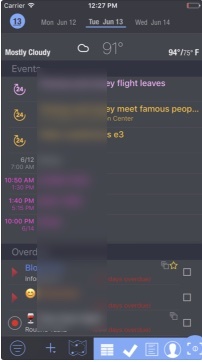 Currently, every time I exit the app and return in goes back to the calendar month view, a view I rarely use. I agree with boydston01 and Ren that the lag while refreshing is far more frustrating than 2-clicks to access. I use PI for years and I am happy with the current navigation. 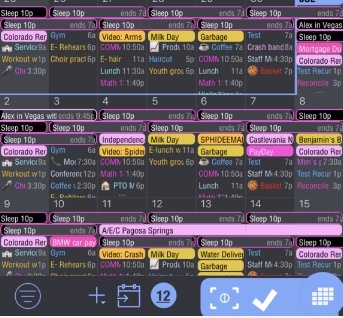 I live from the Focus screen, and switch a lot to column month and tasks. Suggestion: make the animation faster AND make it possible to select a view by tap-hold-swipe (currently hold and force touch bring up the Voice input screen (surprise!). Good idea. We are making the initial animation faster by making it instantly appear. Watched the video. Nice solution! I think that is a good direction (as long as the other buttons are not becoming squished!). The current I5 app icon looks like an old-fashioned oscilloscope, like a batman doing scheduling in his dark bat cave. Could we have more vitality and color in the design? PI4 icon design is even younger and more vibrant. A new design can definitely get you more attraction to new users and thus income. Thanks.